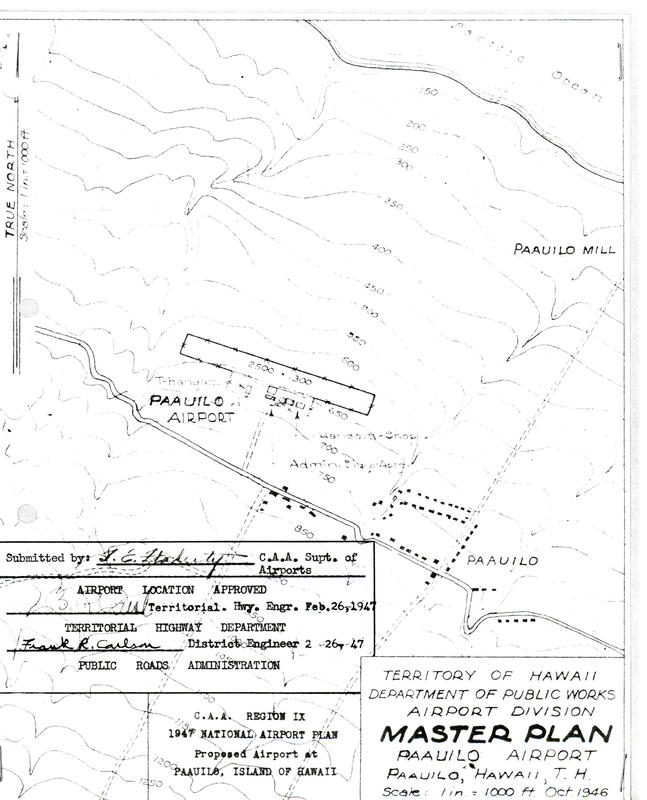 In 1947 the Superintendent of the Territorial Department of Public Works proposed building a Class I airport at Paauilo on the northeast coast of the Big Island, halfway between Upolu Airport and Hilo Airport. The proposed airport was recommended primarily because of the advisability of providing an emergency field and secondarily to promote air tours by private and small charter planes. “The availability of Paauilo as an alternate airport to Hilo during heavy rainfall would provide an important safety factor under such conditions,” the Superintendent wrote. 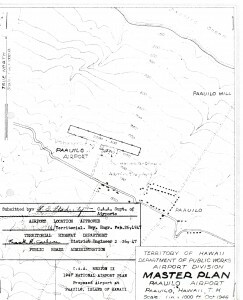 In December 1940, the Territory filed an application with the CAA under the 1940 National Airport Act for the allocation of funds for the construction of an airport in the general locality (actually at Honokaa, eight miles west of Paauilo) but the greater priorities of other construction resulted in no further action. A Master Plan prepared by the DPW in October 1946 was approved by the CAA Region IX as part of the 1947 National Airport Plan. The plan included a single runway 2,500 feet by 300 feet. No further action was taken on the airport.